Rise in geriatric population, growing prevalence of chronic and target diseases, rising per capita healthcare expenditure, and technological advancements are driving the global minimally invasive surgery market, according to a report published by Transparency Market Research. The report, titled “Minimally Invasive Surgery Market - Global Industry Analysis, Size, Share, Growth, Trends and Forecast, 2013 - 2019”, states that exhibiting a robust CAGR of 10.50% from 2013 to 2019, the minimally invasive surgery market is anticipated to expand from a value of US$25 bn in 2012 to US$50.6 bn in 2019. 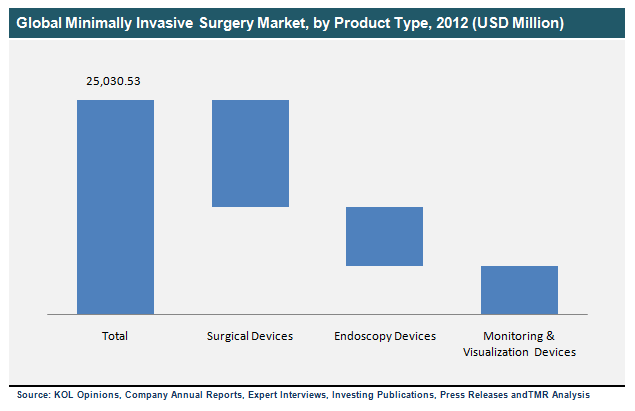 The minimally invasive surgery market is divided into three categories based on product type: surgical devices, endoscopy devices, and monitoring and visualization devices. In 2012, the surgical devices segment – comprising medical robotic systems, electrosurgical devices, and ablation devices – held the largest share of the minimally invasive surgery market and this segment is also anticipated to register the highest growth rate during the forecast period. On the basis of type of surgery, the market for minimally invasive surgeries is categorized into cosmetic, vascular, gynecological, cardiac, urological, orthopedic, breast surgery, thoracic, bariatric, and gastrointestinal. In terms of revenue, the cardiac surgery segment held the largest share of the minimally invasive surgery market in 2012 owing to rising prevalence of cardiovascular diseases and ailments across the globe. Cosmetic surgery, on the other hand, is anticipated to develop at the highest growth rate from 2013 to 2019 thanks to rising disposable incomes and increasing demand for cosmetic surgeries. Driven by increasing incidence of various orthopedic conditions such as reduced bone density and arthritis, the segment of orthopedic surgery is estimated to be the second fastest growing segment of the minimally invasive surgery market. Based on geography, the global minimally invasive surgery market is segmented into Asia Pacific, North America, Europe, and Rest of the World. Among these, North America dominates the overall market thanks to large patient population, presence of leading manufacturers, and a well-defined reimbursement policy. Asia Pacific, on the other hand, is estimated to emerge as the fastest growing regional segment of the minimally invasive surgery market, demonstrating a 13.30% CAGR from 2013 to 2019. This regional market is fueled by rising geriatric population, growth of medical tourism in countries such as Thailand, Malaysia, and India, increasing medical and healthcare expenditure, growing interest in the region by medical device manufacturers, and rise in disposable incomes. The leading companies engaged in the global minimally invasive surgery market include NuVasive, Inc., Biomet, Inc., Surgical Innovations Group plc., Given Imaging Ltd., Teleflex, Inc., Philips Healthcare, Medtronic, Inc., Stryker Corporation, Varian Medical Systems, Inc., Siemens Healthcare, Abbott Laboratories, Inc., ArthroCare Corporation, Intuitive Surgical, Inc., DePuy Synthes, Inc., and GE Healthcare. These players are profiled in the minimally invasive surgery market report based on attributes such as product portfolio, business strategies, company overview, recent developments, and financial outlook.